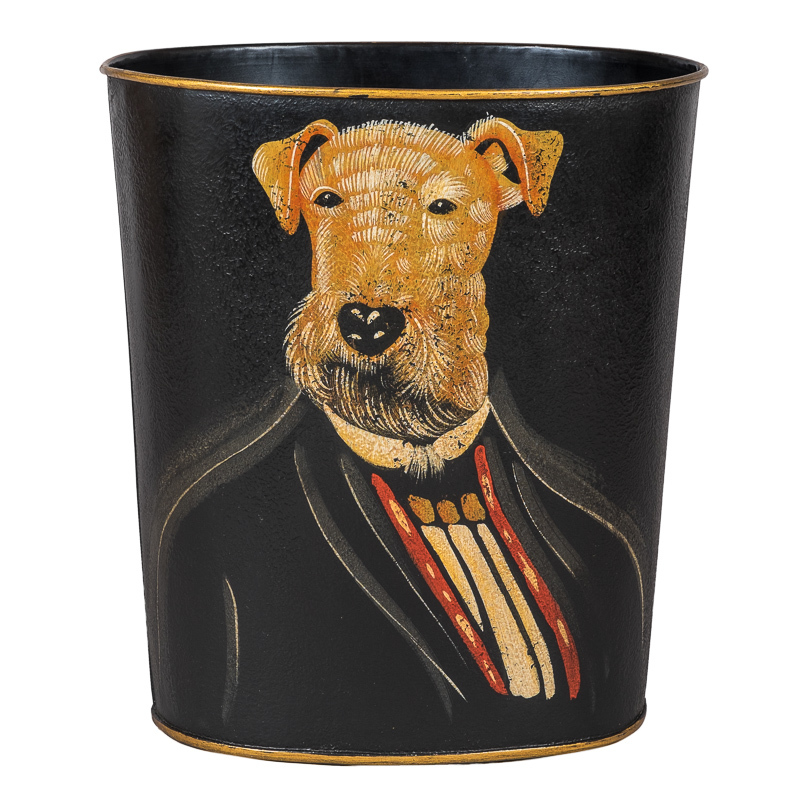 Our new hand-painted dog bins (we love these so much!) come from a venerable tradition of well-dressed canines in art, so we’ve done a little reading up on the subject. Possibly the most iconic dogs in art are those poker-playing, cigar-smoking hounds that are forever associated with smoky American man-caves, wood panelling and a certain type of kitsch taste. It’s not bad going for paintings that have been regarded as the height of kitsch taste for decades. But those poker-loving dogs, created by the artist C.M. Coolidge, are undergoing something of a rebirth of cool – in 2005 two original Coolidge dog paintings sold for $590,400 at auction. Cassius Marcellus Coolidge was a turn-of-the-last-century serial entrepreneur who tried his hand at painting street signs and drawing newspaper cartoons before he hit it big with his dogs. In 1903, advertising firm Brown & Bigelow wanted a new campaign to sell cigars, so they commissioned Coolidge to paint a series of images to use on calendars and other advertising material. This was common practice at the time – photography was still in its early days and many adverts were painted by hand. Coolidge created sixteen paintings featuring uncannily human-like dogs in a series of dramatic situations, nine of them featuring games of poker. For Dogs Playing Poker, as the series is now popularly know, Coolidge drew on the composition of renaissance paintings like Caravaggio’s Card Sharp and Georges de La Tour’s The Card Sharp with the Ace of Clubs – the only difference being that his players had tails and whiskers. So why is Dogs Playing Poker so successful? Why have the images worked their way into our subconscious and into pop art and culture? Coolidge was a modern painter who chose ordinary life as his subject. He didn’t paint royalty or gods or heroes – his dogs are bank managers, lawyers and salesmen in a man’s world of card-playing, smoking and drinking spirits. The dogs are caricatures of successful middle class men of Coolidge’s day, and people found them funny. The paintings were hugely successful – copies were widely available and cheap, thanks to new printing and distribution technology. It was democratic art for the masses – everyone could afford to have Dogs Playing Poker hanging in their den, and the images embedded themselves firmly in the American subconscious. But Coolidge was also drawing on some respectable heritage when he chose to paint dogs like people. Anthropomorphism – making something look human that isn’t really – is an artistic device that goes right back to the ancient world with its Egyptian gods with animal heads and human bodies – Anubis, god of the afterlife had a dog’s head. Animals acting like humans were also often used to lampoon human behaviour or deliver lessons about life, as in Aesop’s Fables from 6th BCE. By the 19th Century, when Coolidge started his career, talking animals were everywhere - Lewis Carroll’s white rabbit, Rudyard Kipling’s Jungle Book, Beatrix Potter’s children’s tales. In mainstream art, Edwin Landseer’s anthropomorphic dogs were hugely popular – Landseer didn’t go so far as dressing them in jackets and hats and making them play cards, but he gave them apparently human-like expressions and emotions and set them in scenes with ironic titles that parodied human society, much like Coolidge’s later compositions. So we love animals looking and acting like humans because it shows up our own pretensions, and it makes us laugh! And why did Coolidge choose dogs? His daughter Marcella once told the New York Times that she preferred cats to dogs, but that she wasn’t surprised at her father’s choice. "You can't imagine a cat playing poker," she said. "It doesn't seem to go." If you love a dog in uniform, have a look at our two fabulous new canine portrait bins – Professor Airedale and our Spaniel Soldier. They’re hand-painted in rich blacks, reds and golds on a crackle effect background – perfect for your poker den or study. We think Coolidge would approve.